Why choose Mike’s Garage Door? Integrity, knowledge and excellent service – these aren’t just words, they represent how Mike’s Garage Door does business. Whatever your needs, you can trust us to offer high quality products and service. A variety of services – from residential to commercial doors, Mike’s Garage Door can help you improve energy efficiency and aesthetic. We install residential and commercial garage doors as well as openers. Looking for a garage door company near you? We serve Leesburg, Elkhart and the surrounding areas in Indiana, offering the finest in garage doors and openers. From residential repair to commercial installation, we have all your door needs covered. We can handle all your needs, from spring replacement to garage door installation. Whether you want to want discuss prices, sizes or anything else, look to our team. Our vast collection of Clopay garage doors can meet every need and stylistic taste! The Mike’s Garage Door team also offers high-quality commercial doors, from security grilles to rolling doors. Do you need repair for your home’s or commercial building’s garage door? Our team is just a quick phone call away! Not only do we offer prompt service, our garage door repair experts have experience working with all different types of residential and commercial doors. Whether something is wrong with the motor, rollers/track or something else entirely, we will determine what the problem is and fix it quickly and efficiently. Never ask, “Where can I find garage door companies near me?” again! Whatever your needs entail, look no further. The Mike’s Garage Door team is experienced, efficient and friendly, and we are always ready to help. Contact us today to learn more about our services or to get a free quote for your project! We sell, install and service a variety of residential garage doors. We have your needs covered for fire doors, sheet doors, dock equipment and more. Our team installs and repairs high-quality garage door openers. Welcome to Mike’s Garage Door, your source for professional garage doors and other products for the home. Builders, contractors and homeowners throughout the Leesburg, Indiana area depend on us for a variety of products and we are proud to serve them. 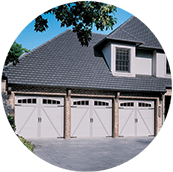 We provide garage doors sales and service in Albion, Akron, Argos, Ashley, Auburn, Avilla, Barbee, Bass Lake, Bourbon, Bremen, Bristol, Buchanan, Cassopolis, Churubusco, Claypool, Columbia City, Constantine, Corey, Cromwell, Culver, Dunlap, Edwardsburg, Elkhart, Emma, Etna Green, Galien, Garrett, Goshen, Granger, Gulivoire Park, Hamlet, Huntington, Indian Village, Jamestown, Jones, Kendallville, Kingsbury, Knox, Koontz Lake, Lagrange, Lakeville, Laotto, La Paz, Larwill, Ligonier, Marcellus, Mentone, Michiana, Middlebury, Millersburg, Mishawaka, Nappanee, New Carlisle, New Paris, Niles, North Liberty, North Manchester, North Webster, Notre Dame, Orland, Osceola, Pierceton, Plymouth, Pottawattamie Park, Rochester, Rome City, Roseland, Shipshewana, Silver Lake, Simonton Lake, South Bend, South Whitley, Stroh, Sturgis, Three Rivers, Topeka, Union, Vandalia, Wabash, Wakarusa, Walkerton, Warsaw, Waterloo, White Pigeon, Wolflake and Wyatt. Read our reviews on Facebook. 5 stars from 12 reviews. You are about to leave this Mike’s Garage Door and enter a third-party site. Mike’s Garage Door and Installed Building Products have no control over, and accept no liability, obligation, or responsibility for, the contents or performance of other websites. Any such link does not constitute an endorsement or any representation regarding, the linked website, its content, its owner, its performance, its owner’s products or services, or any forward-looking statements found in.